Belgian waffles are often served with a dollop of whipped cream and a pile of fresh fruit or berries. There is no doubt that berries are delicious with waffles – but I simply don’t think that the waffle always needs to be made plain. These Strawberry Belgian Waffles are made with the fruit inside, so every bite packs plenty of delicious strawberry flavor, whether you top them with maple syrup or whipped cream and even more berries. 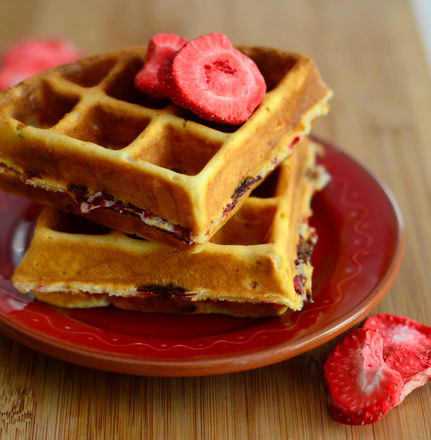 The secret to these waffles is freeze dried strawberries, an ingredient that I use in a regular basis in my kitchen. The reason I like freeze dried fruits is that the have a tremendous amount of flavor and, unlike fresh fruits, no moisture. This means that they can be added to just about any dough or batter without changing the consistency of it. 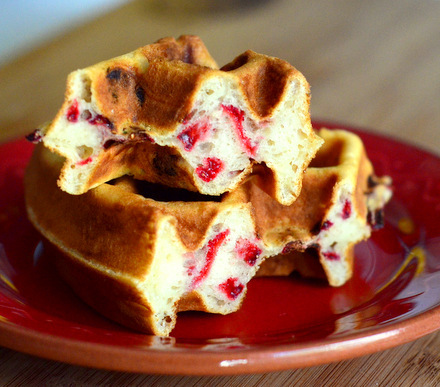 If you added fresh strawberries to Belgian waffle batter, you would end up with a waffle that was slightly soggy in spots, as the berries would leak their juice out into the waffle iron. With the freeze dried berries, the pieces of strawberry stay neatly inside the waffle, ready to deliver their flavor only when you take a bite. The finished waffles are light and fluffy, with a wonderfully crisp exterior and a moist, fluffy interior. Be sure to grease your waffle iron well to ensure that the waffles brown evenly and come out cleanly when they are ready. 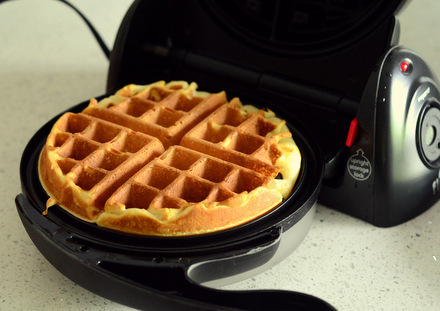 This recipe works best with a Belgian-style waffle iron (I used the Presto FlipSide), but it will still produce tasty waffles with regular waffle iron, as well. This recipe makes about four Belgian waffles, but you can double it if you are serving a larger crowd. Waffles should be served immediately after cooking, but can be held for a few minutes in a 300F oven if you are making multiple batches and want to serve them all at the same time. 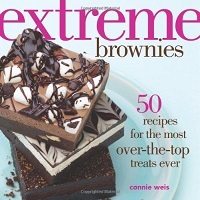 In a large bowl, whisk together flour, cornstarch, baking powder, baking soda and salt. In a medium bowl, whisk together buttermilk, eggs, vegetable oil, vanilla extract and almond extract. Make a well in the center of the dry ingredients and pour buttermilk mixture in. Whisk or stir until batter comes together and no streaks of dry ingredients are visible. Fold in freeze dried strawberries until evenly distributed. Preheat Belgian waffle iron until very hot. Grease lightly with melted butter or cooking spray. Pour about 1 cup of batter (more or less, depending on your iron) into your waffle iron and cook according to the manufacturer’s directions until deep golden on both sides (about 4 minutes in my iron).